The Found Penny Foundation provided a $10,000 grant to the Santa Clarita Valley Youth Orchestra Foundation to help sustain and expand its quality music programs. The grant makes it possible for the SCVYO to continue offering high-caliber instruction, master classes, and performance opportunities. The generous donation was made Sept. 11 when Found Penny’s Trustees Rita and Lou Garasi presented a check to Peggy Cannistraci, Chair of SCVYO Foundation. Found Penny is a private foundation established a decade ago to develop educational and arts activities in the Santa Clarita Valley. It is a partnership with the local community and the private sector. The Found Penny Foundation has been extremely compassionate about SCVYO’s mission, Cannistraci said. She added that Found Penny’s interest in promoting arts and education within the community aligns closely with SCVYO’s goal of making musical arts accessible to more students in this area. “We are so fortunate to be in the Santa Clarita Valley and have support from such dedicated organizations,” said Cannistraci. 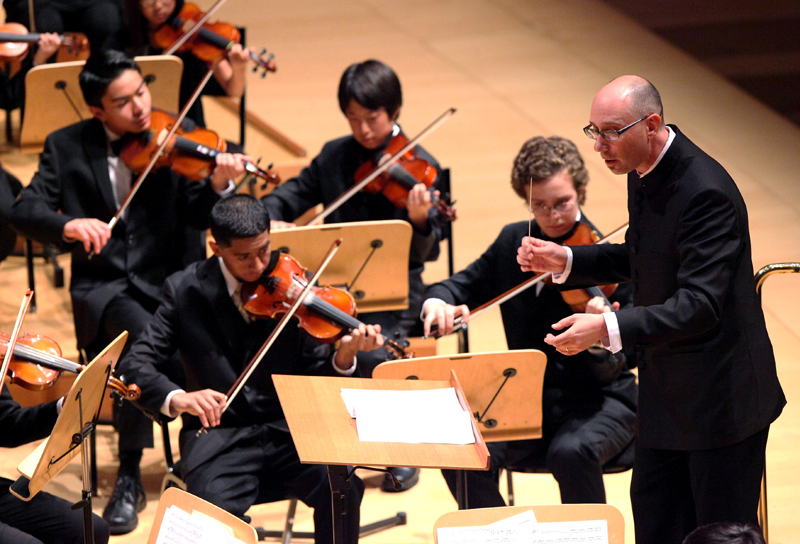 Dr. Paul Sherman conducts the SCV Youth Orchestra at the Disney Concert Hall. * Funding the SCVYO’s collaboration with CalArts through the Community Arts Project. * Providing scholarships and fee waivers for deserving students. * Refurbishing instruments and purchasing new ones. * Offering a summer music program and camp. During its 25-year history, the SCVYO had partnered with the Music Department of the College of the Canyons. Due to reductions in state funding for education, two of the three courses (Prelude Strings and Intermediate Orchestra) were eliminated. This presented significant challenges to the SCVYO to keep the orchestra thriving. The Found Penny Foundation joins several prestigious organizations who have stepped up to revive the orchestras during their transition. Others include SCV Arts Commission, the Newhall Foundation, L.A. County Arts Commission, and Boeing Employees. Keep on the lookout for the holiday performance of SCVYO and Prelude Strings at the Santa Clarita Performing Arts Center at College of the Canyons on Saturday, Dec. 1, at 7 p.m.
Symphony of the Canyons will have its autumn performance at the PAC on Thursday, Nov. 8, at 7 p.m.
Visit www.scvyo.org for upcoming announcements and details. Founded more than 25 years ago, the Santa Clarita Youth Orchestra Foundation oversees the Symphony of the Canyons, Santa Clarita Valley Youth Orchestra, and Prelude Strings. The different groups provide a wide range of musical experiences –ranging from orchestral performance techniques directed by professional musicians to sectionals taught by graduate students from the California Institute of the Arts. The groups have performed at community events and have made appearances at renowned venues such as Disney Concert Hall. They have also performed in Europe and in various cities in the United States. Most recently, all three groups have had the honor of receiving grants from the Boeing Company employees, the Santa Clarita Arts Council, and the Los Angeles County Arts Commission. The SCVYO Alumni Association also offers former students the opportunity to stay involved in expanding the reach of the orchestra.